Serve up some tropical fun at your next summer party! 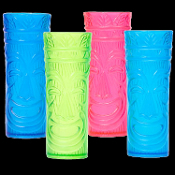 — they’re great for luau, beach, and tropical parties. Plus the vibrant colors add a little taste of the islands. (2 blue, 1 green, 1 pink per package).